The Comics Connection I: Batman does Tögal! As we know, Batman is a man of many talents. Among his lesser know skills is a mastery of esoteric Tibetan meditation practices. Yes, Batman does tögal. His mastery of this technique is revealed in the R.I.P. series of comics, where he uses tögal to experience death, overcoming his last shred of fear. Pretty neat. For those of you who are unfamiliar with tögal (tib: ཐོད་རྒལ།), it is a Dzokchen practice where a practitioner allows their pure nature to shine forth in the form of luminous Buddha images. Rather than being intentionally visualized, these forms appear spontaneously to a practitioner’s visual consciousness. Last time I checked (and I’m hardly an expert on this), tögal is not usually presented as a rehearsal for dying. But I’m getting ahead of myself. Before we dismiss the Dark Knight as an impostor, we should take a look at how he describes the practice he’s doing. 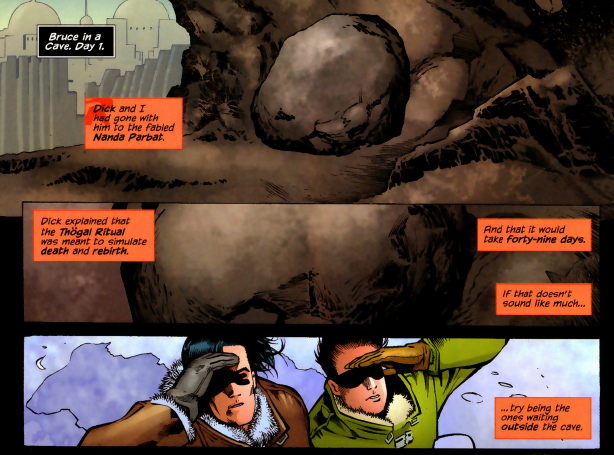 In Robin 175, we learn that the tögal ritual Batman performs (and it is consistently called a ritual, rather than a practice, but let’s not get hung up on semantics) involves staying shut in a Nepali cave for forty-nine days. The goal, we are told, is to simulate death and rebirth. This does not give us much to go on, even though tögal can be performed in a sealed and darkened room, and forty-nine days is the traditional length for the period between death and re-birth. Now we’ve got something to compare with traditional understandings of tögal. First off, we have visions. Check. So far so good. Then the visions stop. In traditional tögal, the final stage of the practice is when all of the visions collapse back in on themselves. Again, check. Finally, we learn that the point of the practice is to reveal the radiant core of the self. In traditional presentations, it is a person’s pure, radiant nature that is the source of tögal’s visionary experiences. So actually, we’re not too far off here. I don’t think many tögal practitioners would describe this radiant core as black, but then again this monk has just tried to murder Batman, so perhaps he was only referring to himself. Again then, check. If Bruce only stopped here, we could say that he actually does a halfway decent job of sticking to themes found in real-world tögal. 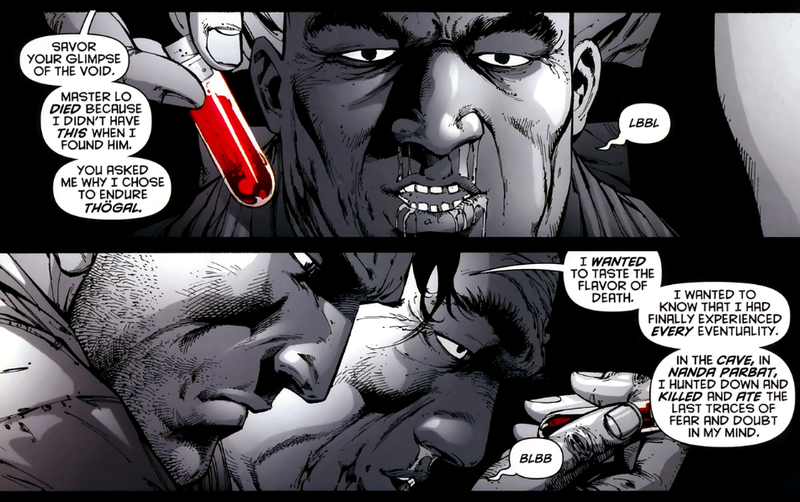 Instead, however, Bruce brings things back to death. 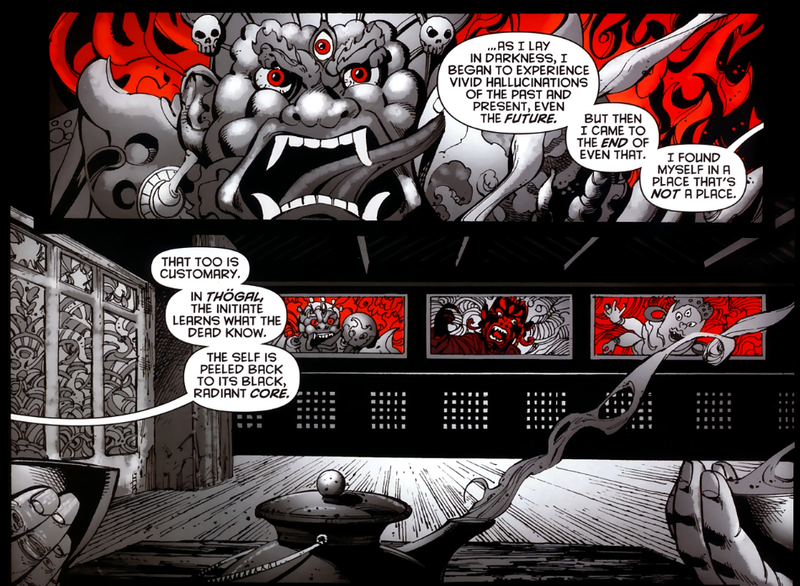 A few pages later, he reveals to the monk why he undertook the tögal ritual, “I wanted to taste the flavor of death. I wanted to know that I had experienced every eventuality.” Again, we’re back to the idea that tögal somehow simulates the death and re-birth process. Now, to be fair, texts such as the Bardo Tödröl (popularly known as The Tibetan Book of the Dead, a text which hails from the same practice tradition that gives us tögal) claim that after death, one experiences spontaneous visions of Buddhist deities. Further, these visions are projections of an individual’s radiant core, just as in tögal. So it might not be too far fetched to see tögal as something of a rehearsal for the events that occur during the death process. Traditionally, however, tögal is not usually presented in this way. Instead, it is a practice for revealing the pure, radiant nature of everything someone experiences, with death being just one experience among many. This may not seem like much of a shift, but it goes to the heart of the practice. Tögal is a practice concerned with experiencing primordial purity in the present moment, rather than a means to prepare for a future event. For an accomplished practitioner of tögal, the death process should be just as radiant and pure as every other moment of their life. So, no, Batman doesn’t quite have his heart in the right place when he undertakes this practice. Still, we have to give DC Comics’ writers some credit here. Despite not quite getting the overall intent of the practice, they came pretty close on lots of the details. Others they missed, such as the ‘Tibetan’ monastery that looks strikingly Japanese, or the cave that looks more like depictions of Jesus’ sepulcher than any Tibetan retreat cave I’ve ever seen. Clearly, however, someone on their staff was into researching obscure Tibetan practices, and we should applaud them for not just making things up, even if the final product is a little off. Thanks to David Germano for bringing Batman’s tögal mastery to my attention.